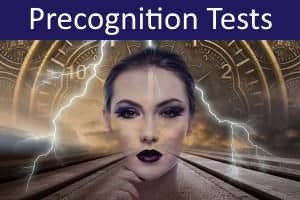 This Unconscious Precognition Test is based on results from research by Swedish experimental psychologist Holger Klintman (1983, 1984). Klintman was investigating a variation on the well-known Stroop Effect. In the Stroop Effect, people take longer to react to a stimulus when conflicting information is present. In the classic Stroop Test, color words are printed in colored ink and the participant has to name the color of the ink. J.Ridley Stroop (1935) discovered that people took longer to name the ink color when the word was incongruent than when the word was congruent. For example, it took longer to say 'Red' when the word printed in red was 'GREEN', than when the word was 'RED'. In Klintman's study, participants named a rectangular patch of color which was then followed by the presentation of a congruent or incongruent color word (printed in black). 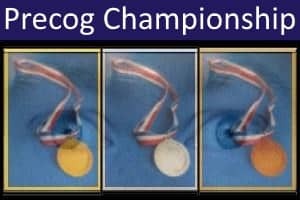 Klintman found that, on average, people took longer to name the patch of color in the incongruent conditions than in congruent conditions, apparently indicating a Time-Reversed Interference (TRI) effect. 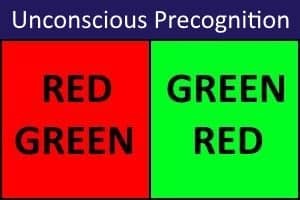 This suggests that the naming of the color is affected by an unconscious precognitive awareness of the word that will follow. This test uses a similar procedure to that adopted by Klintman. You have to respond to the patch of color shown. You do this by clicking on the LEFT button if the patch is RED, and the RIGHT button if the patch is GREEN. If Time-Reversed Interference is found, the average reaction time to the patch of color should be longer when the word shown immediately after is incongruent (does NOT match the color patch), than when it is congruent (matches the color patch). To familiarize yourself with the procedure, you should first attempt the 12 Practice trials. As quickly as possible, you should click the button corresponding to the patch of color shown (the color patch and response buttons will appear after a five-second countdown). At the same time, you should say out loud the color shown. You have to respond within two seconds, or that trial will be timed out. Once you have practiced sufficiently, you can carry out more formal tests by choosing a larger number of trials. On completion of all trials, you will be shown the statistical analysis of the data. The analysis uses the t-test (two-tailed) to compare the mean reaction times (M) to the color patches when the following word was congruent and incongruent. A separate analysis is performed on the Green and Red patches, and on the combined data. 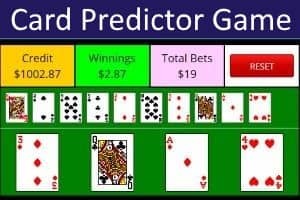 Significant results are indicated when the probability (p) is less than 0.05. Klintman, H. (1983). 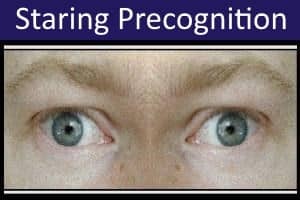 Is There a Paranormal (Precognitive) Influence in Certain Types of Perceptual Sequences? Part 1, European Journal of Parapsychology, Vol. 5.1, 19-50. Stroop, J. Ridley (1935). Studies of interference in serial verbal reactions. Journal of Experimental Psychology, 18, 643-662.